Toshiba America Business Solutions announced a distribution partnership with Brother International Corporation on September 6. Complementing each other's ranges, Toshiba and Brother print products will now be available from independent resellers and members of the Toshiba direct sales network. 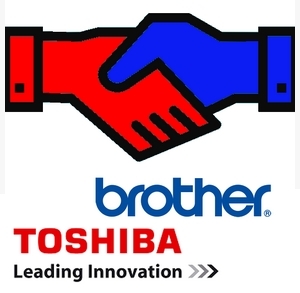 Toshiba customers will find the Brother range of Workhorse A4 MFPs and the full range of Brother solutions and services. An addition to Toshiba's A3 e-STUDIO multifunction machines, the Brother Workhorse series can meet the print volume requirements of small and medium-sized businesses. Brother MFPs can be customized to integrate with several types of workflows, and are compatible with a wide variety of software solutions. The devices can be equipped with security features such as built-in NFC card readers to authenticate walk-up users, and features such as Brother Web Connect that allow users to easily scan to and download documents from the cloud. "Our agreement with Brother is a continuation of Toshiba's customer-centric approach of providing the best print management services to end-users," said Bill Melo, Director of Marketing at Toshiba America Business solutions. "Combining Brothers' A4 MFPs with Toshiba's innovative hardware portfolio and industry-leading assessment and fleet management programs will provide a custom solution to more comprehensively address the specific document management needs of each client." "As the market continues to change, there is a need for channel partners to offer a full suite of scalable and secure products and solutions to serve the unique document management needs of each business," said Bill Henderson. Vice President of Marketing at Brother. "Integrating the Brother A4 (letter-size) hardware lineup and extensive portfolio of customized solutions and services with Toshiba's top-flight A3 (ledger-size) lineup is a win-win that will provide dealers and their customers with a strong document management approach for long-term success."